These systems are unique because they project an image. Many of our other sensor/warning systems, such as AisleAlert, use light, audio or both. LightCop utilizes high-resolution images. It’s a plug & play, ceiling-hung, radar detection system that projects a crisp LED warning sign to the floor below. When its sensors detect traffic—forklifts or pedestrians—in the area, the image flashes to warn both parties of a possible collision. Because this image is bright, clear and flashing, it excels at grabbing attention at just the right time without becoming a constant distraction. It flashes only when there is traffic. It’s long-lasting, rated at 45,000 hours of operation. Since it’s a light system, it won’t peel or tear. 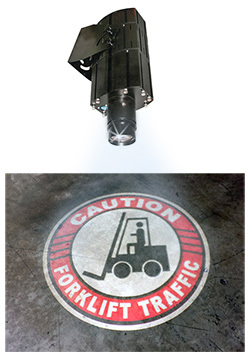 The standard projection is a “Caution Forklift Traffic”, but custom images with stop signs or just about anything else are available. The LightCop unit emits high-intensity light that’s passed through a lens, which projects onto the floor. This image is constant. When traffic is detected, the image flashes for 15 seconds to help alert people of traffic. Once traffic has cleared, the image becomes static again. Once in a while, we run into something so simple that we have to post a video about it. That’s what happened when we saw these simple forklift tilt indicators that can help forklift drivers maintain their loads in level, safer positions as they pick, place or transport them. Once attached to the forklift (takes about a minute), the indicator flashes when forks aren’t level, quickly warning the driver. They’re pretty accurate – within a quarter inch, once correctly installed. They help reduce misplaced and damaged pallets or loads by helping to keep things level, even when the forks are in a difficult position for drivers. The nice thing is, you can move them from one forklift to another. They attach with a strong magnet, so that’s pretty easy as well. They go about a year on one battery swap, and require no wiring or other technical installation. These systems trigger a bright LED light border on a “caution pedestrian” sign, based on an action, when the potential for a forklift collision is present. The lights can be programmed to flash or be continuously lit, and the duration of time the sign is illuminated can also be adjusted to best fit the situation and safety process. Gate activation: In this case, the wireless LED sign is activated when the pedestrian safety gate is opened. The sign is large (24″x24″) and can be placed up to 300′ away from the gate, meaning that pedestrians entering on one aisle or around a corner can trigger a warning at some strategic place elsewhere. 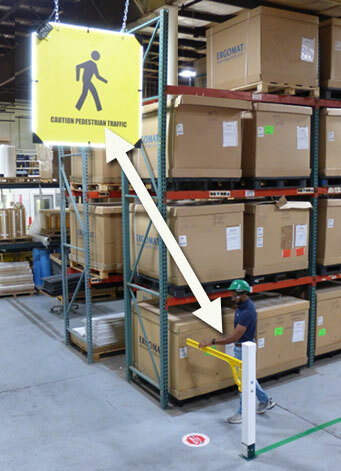 Door activation: When a pedestrian opens the door to enter a warehouse, or other area with forklift traffic, the 24″ double-sided LED sign lights up to warn forklift drivers that there is a pedestrian present to avoid a possible collision. Portable systems: Self-contained sign, power unit and rolling stand allow for the interactive LED sign to be relocated from location to location. these systems are motion sensor activated and can be placed anywhere you need them. Great for temporary traffic areas, loading times, busy seasons, plant reconfigurations and other times when more permanent safety installations aren’t possible. Motion sensor activation: Motion sensors detect approaching pedestrians and trigger the LED lights. These signs come in 12″ or 24″ sizes, that hangs from the ceiling. They can be hung from virtually any structure. 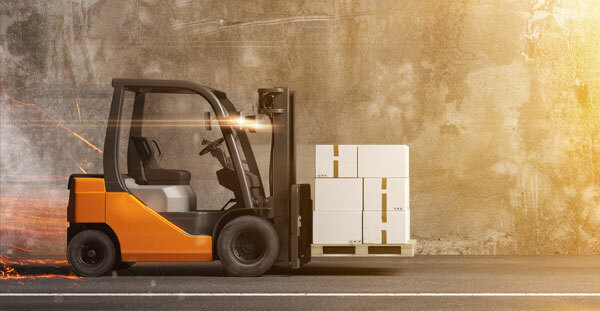 There are plenty of other ideas to reduce forklift issues in your facility, including automated gates, sensor systems, guardrails and lots more. A good traffic management plan in conjunction with safety training for drivers and pedestrians, as well as hard barriers and detection systems, can help you reduce the chances of these types of accidents.